The Lodge has four double rooms and a Family Suite. Each room has its own shower-room and toilet. The Lodge has its own private entrance, parking facilities and garden. 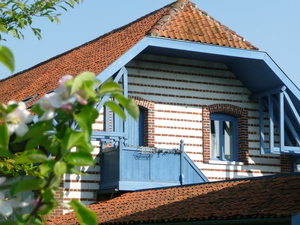 “Petit Tambour” Lodge is in the grounds of a Manor House built by Antoine de Saint Just in 1789 in Autingues, a quiet country village near the historic town of Ardres in Northern France, an hour from both Lille and Bruges. The Lodge has four double rooms, one of which is suitable for disabled people and perfectly accessible for wheelchairs. Each room has its own shower-room and toilet. There is also a Family Suite which sleeps up to four people. The Lodge has its own private entrance, parking facilities and garden. (Animals are not allowed in the bedrooms). Cots can be supplied on request and a tennis table and VTC in hiring on reservation are available for guests use. A stable with boxes and pastures are at the disposal of the riders. Cultural Activities : •Eperlecques blockhouse, V 2 Base. •Museum of the Second World War •Saint Omer Dome •The Fort at Mernoyecques •Route of fortified towns •The “Maison du Papier” at Esquerdes •Clock Tower at Guignes •Earthen Ware at Desvres •Saint Louis Chapel at Guermy •Marble and geology centre at Rinxent Nature : •Walks in marshland at Audomarois (16 km). •Adventure walks at Guines (10 km). •“Nausicaä”: huge Sea Centre at Boulogne sur Mer (30 km). •«Mareis » : artisanal fishing centre at Etaples. •« Les deux caps » : 2 cliffs with wonderful sea views and huge sandy beach good for walking. (20 minutes). •Tournehem Forest. •Hiking. •Treking. •"Le Platier d'Oye". Leisure : •Saint Joseph’s Village, an attractive historical village (10km) •“Bal Parc” : theme park (10 min). •“La Colline aux animaux” at Wierre Effroy (20 min). •Lake for sailing at Ardres. •Beaches (20 min) •VTT. •Riding School (10 km). From Paris: Take A.1 motorway in direction of Lille /Bruxelles. Take A.26 and E.15 following directions for Calais.Take “Sortie N° 2” direction Ardres and then the D217 followed by the D943 direction Calais for 5 km. When you see “le plat d’or”, just after a TOTAL garage, take the D227 on yourleft. At Autingues turn left on the square on the D225 towards Louches and the Lodge will be on your right.